First, measure the circumference of (the measurement around) the head you want to make a hat for. You'll want to subtract about 15% from that number, to allow for stretch and get a snug fit. If you want it looser, subtract less. Then, take that number and divide it by pi (or 3.14,if you don't have a scientific calculator- We're not going for exaction, here. This is an estimation.) to get the diameter. Now you know how wide you need to make the circle that will form the crown of your hat. Make a circle as far across as your calculated diameter, then continue without increasing until the hat reaches the desired length. It's just that easy! And the possibilities for customization are endless. Add stripes, flare the bottom, add colorwork, fold up the brim, decorate it with flowers - you can do whatever you like. After all, you're the designer! 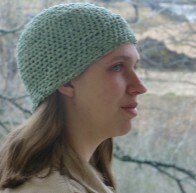 Sample shown was made with (far less than) 1 skein Lion Chenille in Sage and an I/9 - 5.5mm hook.